More information: The band is formed around guitarist Bas Willemsen, and this is the debut album ‘Waves of Destruction’ featuring melodic, symphonic and intense music. 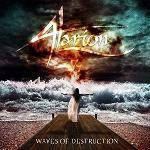 ‘Waves of Destruction’ displays the diversity of Alarion’s music. For each listener, there will be a different part of the album that stands out: be it heavy and fast, or acoustic and mellow, a short track or a 10+ minutes long epic, male or female vocals. Throughout all the tracks on the album, the listener will discover the scope of the sound that is Alarion.